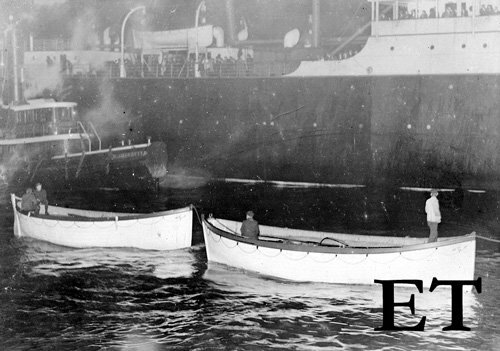 Home Titanic Research Articles Lifeboats extinguished their lights! Lifeboats from the Titanic extinguished their lights in order not to become attractive beacons for swimmers after the sinking. They cut themselves off from sight, and the grim truth is that they thereby callously cut off the lives of their former shipmates. Identical decisions in individual boats cruelly left those in the water blind as to where they should go if they were to save themselves. In closing off the last possibility that those who were already safely in the boats could lose their lives, the decision to extinguish lights also extinguished lives, very likely by the score, if not the hundred. The above is what must have happened, although it has never been openly stated in print. It may have been an emergent issue carefully avoided, if not suppressed, at the British inquiry. This article, however, will set out reasons why what must have happened did indeed happen, shameful as some might consider it. Titanic lifeboats landed at New York. Without a powerful magnesium flash, this would be a black square. We begin with the order to clear the lifeboats, given around midnight. Officer Lightoller said he started with No. 4 boat on the port side. ‘From the time we commenced to strip No. 4 boat cover, until the time when we swung them out I should judge would be probably at most 15 or 20 minutes.’ (Br 13828). It is around this time on the boat deck, when one of the men lowering the falls of No. 4 gets a direct order from Captain Smith. Lamp trimmer Samuel Hemming told the US Inquiry (p. 665): ‘It was No. 4 boat… we lowered the boat in line with the A deck, when I had an order come from the Captain to see that the boats were properly provided with lights. ‘The boats that were already lowered, I put them on the deck, and asked them to pass them down to the end of the boat fall. As to the boats that were not lowered, I gave them into the boats myself,’ Quartermaster Hemming said. He told Senator Smith that some few boats, three or four, had been lowered before he got there with the lamps. ‘Quite three or four.’ But this does not mean those boats had cleared the ship’s side, as he said he gave them to the crew still at the falls, asking that they be passed down. Such very likely happened. With the other lights he had, he mostly gave them to persons in boats not yet lowered. But he also personally placed them into two or three boats on the port side. He described them: ‘It was a square lamp. About that high and that square. (indicating). Yes, about that high (He agrees with ‘10 inches’ suggested by the Senator). Hemming said colza oil was burned in the lamps. This is a vegetable oil used extensively in domestic settings and even for lighthouse ilumination before the advent of coal gas or kerosene. Brighter than whale oil, it was the preferred oil for train lamps, and was used for lighting railway coaches in Britain before gas and later electricity. The oil and size of the ship's lamps spoke to their intended clear brightness. And one went early into every available Titanic lifeboat. Hemming told his story again to the British Inquiry (Br 17750 onwards). He had a message from the Captain to go and get some lamps. He couldn’t say how many boats he put lamps in, but it was those on the davits. The exact number of lamps emerged in six questions asked at the end of Hemming’s British evidence by Sir Robert Finlay, counsel for the White Star Line. 17779. How many lamps did you bring up? — Fourteen. 17780. Were they all full of oil? — All full of oil. 17781. And properly trimmed? — All brought up alight. I lit them myself. 17782. Did you supply them yourself to a good many boats? — Yes. 17783. You did not put those 14 [lamps] yourself, as I understand it, all into the boats? — No. 17784. But they were there for the use of the boats? —They were there for the use of the boats. 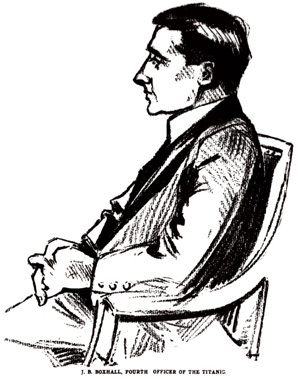 Finlay asked no further questions (likely because he dared not), and the witness withdrew. The likelihood is that not one of these lamps was wasted, and that they went therefore into fourteen Titanic lifeboats. The emergency boats were the cutters, Nos. 1 and 2. Therefore all standard Titanic lifeboats were provisioned with brightly-lit lamps from very early on in the sinking. The significance of this simple point cannot be overstated. Whether Hemming responded to a direct order from the Captain or one from Boxhall (one would have to favour Hemming’s own repeated evidence) is less interesting than whether he acted alone or took ‘a couple of men down with him’ as recommended by the Fourth Officer. If he acted alone, then he must have made four trips to the lamp room, located immediately to the port side of the forecastle, at the forward well deck. He could carry four alone, but a fourth trip for the last two would be needed to reach 14. The evidence is silent on the subject, but knowing the number of lamps needed, it must be possible that Hemming, a Quartermaster with some seniority, enlisted help. He refers to no-one else but himself, yet appears to have been only personally seen on the port side, whereas he plainly insisted that lamps had also been distributed to starboard. In his US evidence, once more emphasising earliness, Crawford said: ‘The lamp trimmer brought a light long before we were lowered into the water.’ He named Hemming, who ‘had a handful of lamps, taking them to all the boats.’ He repeated that he saw Hemming do so. 1227. Did you look in your boat for a light? — I had a light served out to me before I left the ship. 1228-2. Who served it? — A lamp-trimmer, Sir… I see him coming along with the lights, and he had orders to give me one of them. 1233. Did he have any other lanterns with him? — Yes, Sir, several. 1234. Of the same kind that you had? — Yes, Sir. 1235. And he served you out one as he passed? — Yes, Sir. 1236. And then went along as far as you could see to the other boats, is that right? — Yes, Sir. 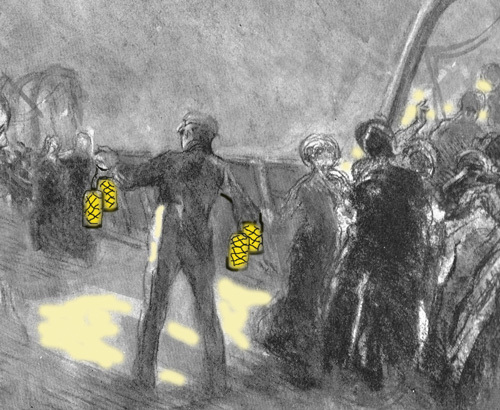 Officer Lightoller, when asked at one point the leading question as to why 'so few' lifeboats apparently had lamps, replied (Br 14479/80): ‘I don’t think I have conveyed the idea that so few had lamps… Well, I didn’t look for lanterns, and I cannot say. You can get that evidence as to the lamps from Hemming, the lamp trimmer, who took the lamps and lighted them and went round and distributed them to the boats.’ All the boats, said Crawford. Thus the port side is well attested (further examples could be cited). No-one mentions Hemming, or refers to him as a lamp trimmer, on the starboard side; nonetheless we have Hemming’s evidence that he served lamps out to starboard. Senator Burton: Did you see a light? Olliver: I saw lights in the boats, being displayed by the boats. Senator Smith: Did you have any lights on No.5 lifeboat? Pitman: I did not have a light in my boat, no. Smith: Do you know of any boats that did have lights on them? Pitman: Yes there were several of them that had. Smith: But they did not all have lights? 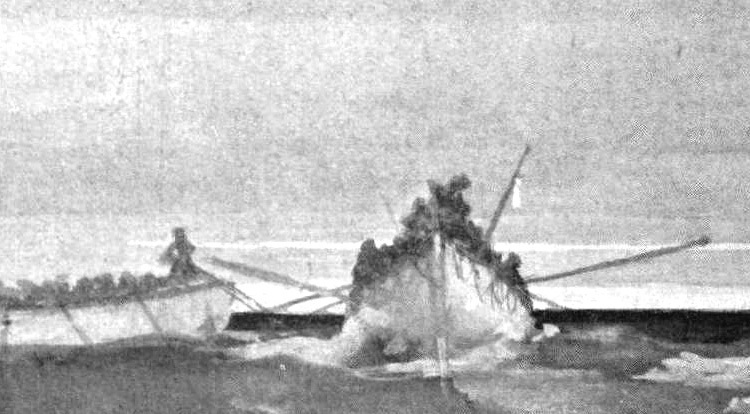 Pitman at a lifeboat on the Adriatic. 10275. Did you find a lamp in your boat when it was lowered? — No, there was no place to look for any lamp. 10276. Were there lamps in any of the other boats you saw in the water? —Yes. 10277. How many? — I saw three. 10278. Three other boats with lamps in them? — Yes, three other boats with lamps in them, and there may have been more. Greaser Frederick Scott (eventually saved in No. 4) saw ‘a lot’ of what proved to be boat lights on the starboard side when he eventually gained topside, the order to leave the engine and boiler rooms being given at 1.20am. 5663. Could you see at all whether there were any boats forward on the starboard side? Scott — No. I saw a lot of lights a tidy distance away from the ship, and the chaps thought it was a ship overhauling us and somebody said they thought it was a lifeboat, and the others said they could not have got out so far; but we happened to find out it was a lifeboat. 5830. Did I catch you to say that you saw the lights of a number of boats belonging to the Titanic when you were on board? — Yes, on the starboard side well away from the ship. The lights were thus on a number of starboard boats when they were on the open sea, having departed. The evidence of Hemming is corroborated. But the significance of what now emerges is that the boats must have doused or hidden their lights, one by one, as the sinking worsened and it became increasingly obvious the Titanic would go down. All boats were fearful of being swamped by swimmers. They ignored megaphone calls from the Captain to come back closer, the evidence shows. Keeping a light on when others have doused theirs increases the chances of your own boat swamping because more swimmers will make it their target. The irresistible urge is to follow suit when other boats are disguising their location. There are never any exclamation marks in the inquiry transcript. But this is a realisation of horror on Hemming’s part. There should be a necklace of lights out to starboard. But there are none. Everything was black. Those that survived all swam blind and were effectively lucky in bumping into boats or eventually seeing them after their exertions. For those with the keenest night vision, the maximum visibility in the inky black appears to have been just fifty yards and must have been much less for most. 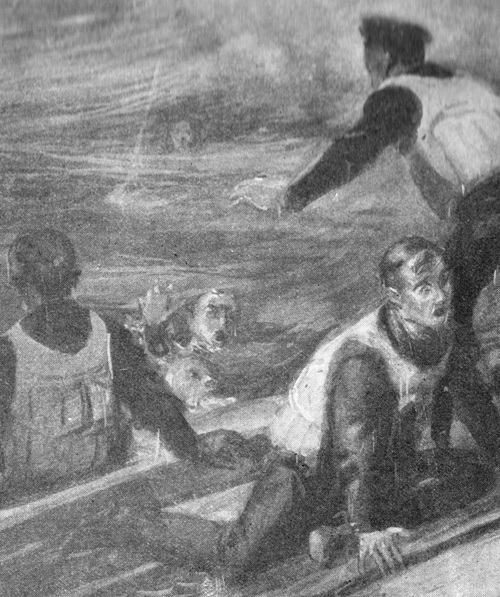 The Phillip Gibbs’ ‘Deathless Story,’ published immediately after the disaster, credited George McGough with a tale of how as four firemen were seen on the poop deck just before the vessel sank. One of the boys, named Dillon, said to Bannon: ‘Johnny, there’s a light over there. I’m going to strike out for it. Are you coming?’ It tells how Dillon then went over the side. 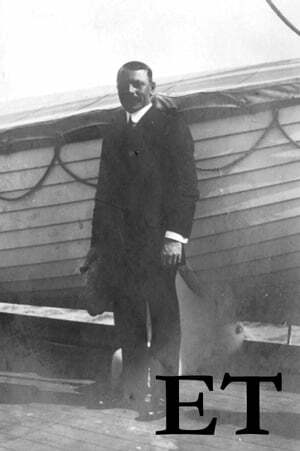 Steward Andrew Cunningham swam around in the water until he saw the ship go down, then turned to look for a lifeboat. Asked ‘Did you see one?,’ he told the US Inquiry: ‘No, I heard one, and I called to it.’ The lifeboat didn’t come toward him – he swam toward it. It is likely that No. 4 never had a light, since Hemming was called away and the boat was later rather forgotten as it hung at A deck. But if they saw no lights themselves from 4, then it is indicative that the port side boat lights had gone out one by one, as they did to starboard. We know a flotilla of boats was formed on both the port and starboard sides after the sinking, but there is zero evidence that these were concentrated islands of light - hence the opposite must be true. The lights were out. Officer Lowe only left his port side flotilla to go back towards the death zone when the cries had thinned out. They didn’t reach him. Of course failure to reach is a product of both darkness and distance – the lifeboats tried to get as far away as they deemed safe for themselves, mentioning only suction rather than a fear of their fellow humanity in their later evidence. But that same dread produced a policy of blackout. This can actually be seen in one of the more puzzling concerns to modern students – what we regard today, without thinking, as rather quaint complaints about smoking in the boats. There is the fear of swamping, which became a panic. And the distaste for smoking was akin to a primitive fear of fire – because the flare of a match lighting, or a pipe being lit, was illumination. And even a flash of light could identify one’s own self for extinction. Those panicked in the boats did not want smoking because they did not want lights. By the time the survivors reached shore, the original fear instinct had been forgotten and the smoking issue had become transmuted into an upper class foible or social gracelessness. Mrs J. Stuart White said: ‘Imagine getting right out there and taking out a pipe and filling it and standing there smoking, with the women rowing, which was most dangerous. We had woollen rugs all around us.’ Her mind justified her primeval fear when it came to penning an affidavit. There was plenty of water around to put out any rug fire. Her original fear was of the flare of a match acting like an airport landing light, guiding swimmers in her general direction. Detestation of smoking was fear of fire - aversion to light - the very real phobia of being sunk by swamping swimmers, those hundreds jumping overboard. Of course the lifeboats put their lights back on after the drowning people very satisfactorily were dead and silent. Some re-lit and some didn’t. They only lit papers in the boats when it was safe to do so… and only when it was important to their own rescue, not the rescue of others. Even though Hemming had supplied the boats with lights, the simplest thing afterwards was to say your own boat never got one, or you couldn’t find it. Nobody could be in a position to prove to the contrary, yet it could even be that people genuinely convinced themselves, so that what follows are not barefaced lies. Some may be true. 767. Was there any lantern or lamp on the boat? — No, Sir. 769. Where did you look? — We looked everywhere, everyone tried and looked the best they could, and there was no light in the boat, none whatever. 2630. Were any of these three or four boats that you assisted in launching provided with lights, lamps? — I did not look for them. [He avoids directly answering the question]. 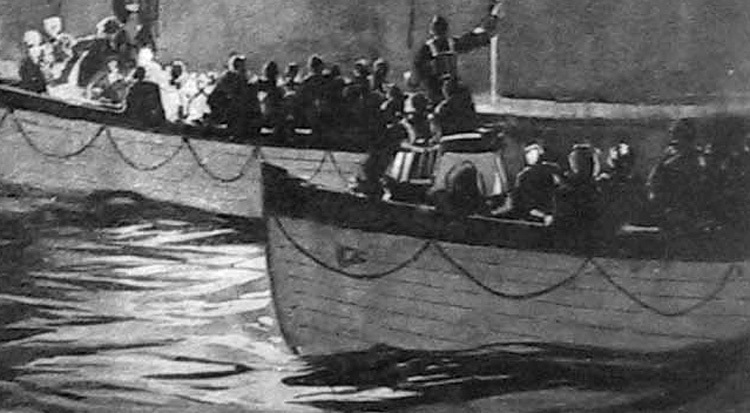 Lawrence Beesley, also in this boat, wrote: ‘None of the other three boats near us had a light, and we missed lights badly: we could not see each other in the darkness.’ But it may have been that they had lights displayed at one time. 5071. You had no lights? — No. 5072. Do you mean there was no lamp or lantern in the boat? — Not a lamp or lantern. AB George Symons agrees (Br 11827). Yet it had been Hemming’s duty to light this boat, and he had done so at 6pm. Albert Horswill (also boat 1) ‘I was ordered to the port emergency boat (no. 2). I was ordered to put the lantern in the boat…’ But this boat had likewise been equipped with a light since 6pm. Senator Bourne: Did you have a light on your boat? — No, sir, no lantern, sir. I searched for the lantern. I cut the lashing from the oil bottle and cut rope and made torches. [Later in the morning, presumably]. Corroborated by Wheat (Br 13216). ‘We kept on pulling along to keep up with the other boats, all the small boats being together. Senator Bourne: How far could you see on the water that night; how far off could you see another boat? — About 50 yards. He is talking about his fellow crew. But virtually none of these very powerful swimmers lived, the facts show. He admitted to Senator Newlands that he saw no men saved in this way. None was taken into his boat. Newlands: Did you see them being taken into any other boat? — ‘No; it was too dark. I could not see, sir.’ The lifeboat lights were obviously out. Being a powerful swimmer was of no use. Wheelton is effectively saying lifeboats lights came on again later in the morning. They could safely be re-lit or displayed after the cries had subsided. Lamp trimmer Hemming was amazed and shocked that everything was black on the starboard side, and yet we have the greatest evidence of his passing down lit lamps into all those boats in turn on the port side. But here, too, there are denials. Because pleading ignorance of any light or lamp is easy to do, and becomes an established practice. Senator Fletcher: Was there any light in this boat, No. 10? — No, sir. No lantern? — No lantern at all. 3170. When you hailed the other boats in the course of the night before being rescued, did you observe whether or not they had lanterns? — Nobody had a light; only Mr Lowe had a flash electric light belonging to himself, I believe. 3171. Is it your evidence that all the boats you came across from leaving the Titanic until you were rescued were unprovided with lanterns? — Yes, quite right. 3173. (The Commissioner) No harm occurred as far I know from there being no lanterns on board? — No, my Lord, none whatever. An astonishing interruption! Does he expect the dead to testify? Later Poingdestre was quizzed again on the issue (Br 3329). Now, with regard to the lights on the boats, you saw none at all after the boats were all in the water? — No. 3330. Don’t you think you may be mistaken? — I saw a light, I saw another accident boat [cutter] burning a blue or a green light. 3331. I mean ordinary boat lights? — No, I did not. 3332. (The Commissioner) The ordinary boats’ light is white? — Yes. 3333. (Mr Laing.) Did you see the lamp trimmer carrying about a lot of lighted lamps on the boat deck? — No. 1293. Were you sufficiently near the other two or three boats to observe whether or not they had lights? — Oh, yes. We kept on showing our lights. The boats that had lights kept on showing their lights. Everybody did not have a light. 1317. You said that after you left the Titanic the boats that had lights were showing them to each other? — Yes. 1318. Can you say how many boats you saw lights in? — No; I did not count them. 1319. Were there two, or three, or four? — Five or six of us. 1320. Five or six other boats had lights as well as yourself? — Yes. 1341. Did you borrow a fireman from one of the other boats to help you to row? — Yes that was in the morning part, to row back to the Carpathia. 1342. — In fact I know we pulled back to the ship immediately I got him aboard, because all the other boats were going ahead of us showing us their lights. 1362. (The Commissioner) Couldn’t you hear where these cries came from? —Your Lordship, in the meantime, the boats were yelling one to the other.The boats were yelling one to another, as well as showing their lights, to try and let each other know whereabouts they were. Hichens’ evidence goes to show there were initial lights when launched, that these were extinguished when danger to the lifeboats loomed from those in the water (with boats only concerned with their own safety), and then lights were shown when important to identify themselves to the Carpathia. A new excuse - they had already been lit. This is the same Peuchen who also testified (US p.337): 'As we rowed, pulled away from the Titanic, there was an officer's call of some kind... a sort of a whistle. Anyway, the Quartermaster told us to stop rowing so he could hear it, and this was a call to come back to the boat... But the Quartermaster said, "No, we are not going back to the boat." He said, "It is our lives now, not theirs." ‘We could see those different lifeboats that had lights. They were all over. They were not all staying together at all. Some of them were going east, west, north, and south, it seemed to me, but there was one boat that had a sort of an electric light, and one a sort of a bluish light as well.’ Peuchen thus saw lifeboat lights 'all over' at a particular time - but no surviving swimmer saw one when it mattered. 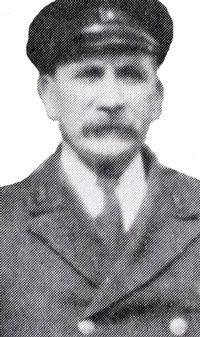 Seaman Joseph Scarrott was in boat 14, which eventually returned under officer Lowe to look for survivors. 475. — There was one thing we found was not in her after going away, and that was the boat’s lamp. 479. And it was not there? — It was not there. I looked under all the thwarts. Scarrott later agreed that it was very important that a lifeboat laden with a full complement of passengers should be provided on a dark night with a lamp. That’s obviously what Boxhall thought when he wanted them all so provided. There is no point rehearsing the endless contradictions of those who swear they were left with no lamp, and on the other hand, those who claimed to have been brightly lit and that many another boat was lit as well (which rather blames the swimmers for their own demise). But since Boxhall, with his green pyrotechnics, later became the bearer of light (and his No. 2 boat thereby the flagship of all escape craft), it might be worth considering his account. Senator Smith: Were there any other lights visible on the lifeboats except those on your boat? Boxhall: I saw some lifeboat lights, but the usual lifeboat's lights. They were very dim, small lamps. Senator Smith: If all those lifeboats had been lighted, it would have impressed itself upon you, would it not? Boxhall: I saw several of the boats - in fact all of the lifeboats - when I was in my boat, which had lighted lamps in them. Senator Smith: Had lamps in them? Boxhall: Had lamps in them - before I saw the Carpathia. So all the boats had lamps in the later morning. This is what Boxhall asserts, what he wanted to achieve earlier in the night, and a desire which Hemming implemented. Yet many boats claimed to have no light at all. In Collapsible D, there was the attempted Peuchen defence of non-working lights, even though they had been passed in while burning, and it seems it would have been necessary to manually open a glass door to quench them. We have no information on who made the Titanic lifeboat lamps, or what they looked like. 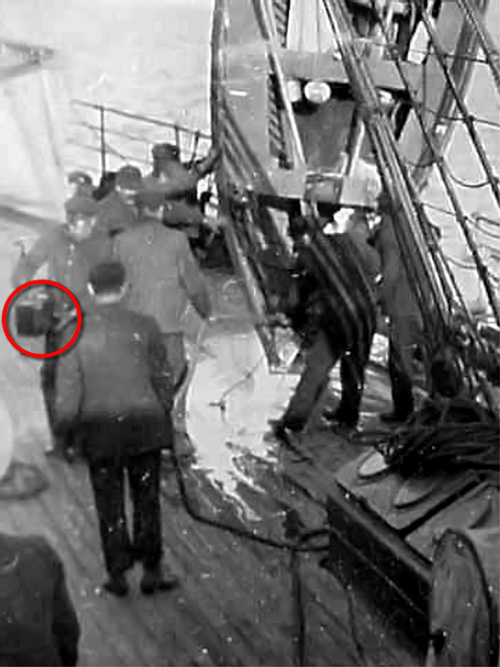 It has been suggested that the picture below shows a lifeboat lamp being removed while lifeboat 2 is hauled onto the Carpathia. But this is pure conjecture - it could as easily be a bag or box or somethng else. Senator Fletcher: Did you have a light in your boat? 15469. After she sank, did you hear cries? — Yes, I heard cries… I was showing green lights in the boat then, to try and get the other boats together, trying to keep us all together. But if they were lit during the period of the cries, then he should have done. The occupants of other boats were rallied to the White Lie flag. Should not some occupants have told her that they did indeed have lights? Miss Shelley has over-egged her pudding. Affidavit of Catherine Crosby (attributed to boat 7). Whether her boat went early, and thereby missed a lamp, how could she know of all others? Senator Smith: Where were those lights displayed? Boxhall: I was not close enough to see. Boxhall: Just in the bottom of the boat. I could see the reflection of the lights; I did not see the lights themselves. Senator Smith: But you are not ready to say that they all had lights burning, are you? Which way does he want it? James Johnson suggested there might even have been two lights in No. 2, besides its box, or boxes, of flares or company signals. Nobody did anything of the kind when the swimmers actually needed it. Senator Smith: How long did you lay by at that time - after you picked these seven people out of the water? Hemming: Not long, sir. We made for a light. Senator Smith: You saw a light? Hemming: Yes; one of the boats' lights. Senator Smith: You mean a lifeboat light? But this may be the exception that only proves the rule. Hemming saw but one light. After picking up seven men – meaning a considerable time post-apocalypse. As his boat was heading to the outer rim at last, he might have been seeing Lowe’s No. 14 on the way back in - only for claims that she too, did not have a light! 10603. As you were one of the last to leave the boat before she sank, I want to ask you this question: Did you observe just at that time [ie, before she sank] the lights of any ship in your vicinity? — I never saw any, sir. 10604. Or even when you got into the water and onto the raft? — ‘Only the lights of our own boats.’ His raft was not relieved from some hours, and these sequential questions do not mean their time periods had to closely follow one another. Did he see lifeboat lights when he was on the raft? Yes, he did, but later. Collapsible B was washed over to starboard. Hemming said there were no lifeboat lights there just before then and Brown agreed with him (Br 10603). The evidence is clearly telling us what happened, yet it needs to be judiciously sifted. Certainly witnesses saw lifeboat lights, and quotes can be ripped from context, but the timing was probably later on. They were lit up when rushing for the Carpathia. When they wanted to be seen. Yes, all the people already in the standard lifeboats. The related lifeboat equipment questions about compasses, food and water, etc, in some cases are attempts to muddy the water, or to distract through addition. 14865. With regard to the lamps which those lifeboats carry, did you yourself see any lights while you were afloat in the boat? — I did, several. 14866. From other boats in the sea, I mean? — Yes. 14867. In which the people were? — Yes. 14888. (The Commissioner) Lamps belonging to the Titanic? — Lamps belonging to the Titanic’s lifeboats. Not used. Hidden by those in the boats. So that they could not be seen. An accusation totally overlooked in the Titanic canon. ‘Almost like murder, wasn’t it?’ storekeeper Frank Prentice said to ITV in 1982 in reference to the whole tragedy. He was eventually pulled from the water into No. 4 boat. In a 1912 newspaper account, he said those in the water had 'encouraged one another by shouts.' They had no other resort. Lightoller knew the truth of the Great Betrayal. He had every right to feel pure disgust. Because Lightoller - like Hemming, like Prentice - was a swimmer. (c) All rights reserved. Article available for licensing. All images courtesy of the contributor.